My stock steel wheels 15's run fine on the toll road no shakes. My aftermarket wheels are 17's. I've gone to two places so far (one reputable) twice to one of them and still have the issue even after all 4 wheels have been balanced 3 times now. Tyres have also been taken off and put back on re-balanced same issue. Any suggestions? personal experiences?. I've gone through google b4 coming here so please. Where can i go that can balance my wheels to stop them shaking on the toll. 1) are the tires brand new? 2) are the rims brand new? OK some more for you. 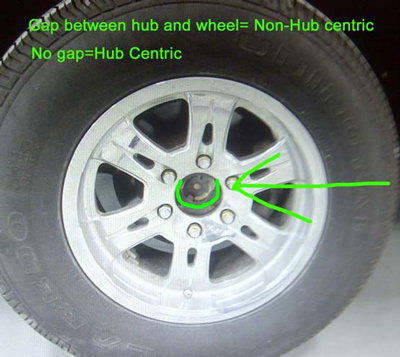 3) What is the Center Bore of the Wheel Hub? 4) Is the center bore of the Rim larger than the Hub on the car? 5) is the rim designed for self centering lugs or straight lugs? Though new, TYRES may be warped. Don't overlook them. 5) is the rim designed for self centering lugs or straight lugs? - I'm not that savvy on rims, but i can tell you currently i use the regular lug nuts that uses the key since that the only thing that i've found so far that fits in them holes. 5) is the rim designed for self centering lugs or straight lugs? - I'n not that savvy on rims, but i can tell you currently i use the regular lug nuts that uses the key since that the only thing that i've found so far that fits in them holes. That is probably the source of your problems. The Rims are NOT perfectly centered on the Hub. I will tell you more about that later on. Thinking of buying a new set as a LAST resort. Any suggestions on a proper brand that carries that size? I patiently await...steel wheels can only be bolted up one way in one exact location seeing as how the holes of the rims are designed....but wouldn't putting on all 4 lug nuts and tightening in a diagonal fashion align the wheels correctly on the hubs? 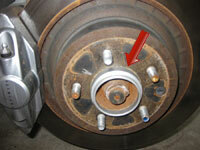 When Factory wheels are on a car, the center bore of the rim fits snugly (no gaps) on the Hub. 1) It places the weight of the vehicle directly on the rim which 2) removes the stress on the studs and nuts. This is also one of the common reasons for stud failure when people use after market rims. In addition most factory wheels also use self centering lug nuts and the rims them self have tapered holes to also make sure the rim is centered. all of the nuts must be the same size and preferably as short as possible. I see folks using very long colorful lugs which extend beyond the rim, well guess what these add to the overall balancing of the wheel on the car. Unless the rim is of the type that needs them then dont use them. If your rim is a tapered hole "lug centric" rim, them make sure the lug nut has the correct seat angle to match the rim. Now if you are using mag rims, usually the holes are NOT tapered. They are Flat. These rims tend to be HUB CENTRIC. Therefore you must use Hub Centric Adapters or rings to match the hub on the car to the bore of the rim. This is to center the rim on the car as well as to place the load of the car on the rim and not the stud. 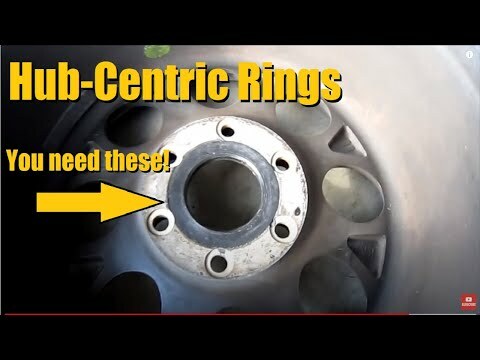 To do this you will need to use the Hub centric rings like that shown in the photo above or sometimes you can use a wheel spacer adapter with the correct Center bore measurements to match your rim. I should have also mentioned that using a rim with an Incorrect OFFSET can also affect balancing. If the rim has too much NEGATIVE or POSITIVE offset, it will change the center of balance of the entire wheel relative to the Hub. If your hub is weak or have worn bushings this can seriously place some stress on your suspension components and cause unwanted suspension movements and abnormal tyre wear. You can only use WHEEL SPACERS to correct too much positive Offset, so my preference is Rings. However you will need to test fit the rings with the hub and rim. Some rings will still leave a gap behind the rim and thus not make contact with the hub. Try and find out what the FACTORY rim offset that came with the car for the size tire that you are using and stay +/- 10mm of that number. "When Factory wheels are on a car, the center bore of the rim fits snugly (no gaps) on the Hub." its a centering problem my stock factory wheels are 8 lug universal steelies as i said before. The centre bore of my factory wheel "DOES NOT" fit snugly. This leads me to believe from my research that i need my wheels lug-centric balanced rather than hub-centric balanced. Anybody know anywhere that does this. I'm pretty sure if i take the car to somewhere that does balancing today they will check the wheels and say once more they are not balanced properly by the previous palce they will balance them and i will have the same issue on the toll. factory 8 lug? So they would be lug centric. as long as you are using the correct lugs. But is your new Rim lug centric? even if it is, still get the rings and the correct lugs to go with it. Many moons ago some places used to balance the wheels on the car. This required jacking up the car and placing a machine against the tire while it was on the car. Note that cannot be done on all cars (eg Subarus AWD) so be careful. also as stated before by another member, it is possible to get a warped tire. So while it is on the balancer look for up and down movements of the tire. This has happened to me. I had to replace a pair some years ago for that exact reason. Many moons ago some places used to balance the wheels on the car. This required jacking up the car and placing a machine against the tire while it was on the car. Go this used on another set of wheels on another car car drove terribly on the toll! Running the wheels on it and feeling the steering wheel for shake, worst balancing job i've ever had. Highly unlikely. And how you know it's all four tires are not balanced? That would be almost impossible to check . one tire alone can vibrate the crap out of a car. Go to a different shop to balance the tires, BUT don't let them remove the weights. Let them spin the tires and see what their machine says first. Precision took them off last, checked them first said they werent balanced, balanced them and then said they are balanced now and still the steering wheel shakes and the back shakes so pretty sure its ATLEAST one tyre on the back and one on the front. I had the wheels on a AE110 fist and had no problems on the toll and they were balanced by Tyre warehouse of all places and it drove great at all speeds on the toll since changing the series for this car now it seems like no ends of problems. Bored Sleeved and waiting for BOOST !! 105 hp @ 4800rpm / 137 ft·lbs @ 2800rpm. 180 hp @ 4800rpm / 202 ft.lbs @ 2800rpm. both stock soon to be modified!!! only time will tell "One Group One Nation"
ask for "high speed balancing"
Anybody ever had good results using it?? The last time I used that type of balancing was in the 90's on a VW GTI. There was a place in Ocho Rios that had it. I dont recall ever having a problem. Life is short n you don't get repeats so LIVE IT! Going to switch back to my stock rims just to make sure i'm not going crazy!